– January 31, 2017Posted in: SusieQ FitLife, SusieQ FitLife Breaking News, SusieQ FitLife Updates! It’s never too late to make changes to greatly impact your life, even if you have 2016 regret! You have the ability to create your FitLife goals & accomplishments for 2017, even without setting one resolution. So why is there a New Years post coming out when it’s almost February? Well, the truth is that some resolutions may already be broken and many were never set in the first place, so we can all use some motivation if we are dealing with any guilt. Let’s begin with some honesty and real confessions. SusieQ FitLife needs to come clean about having failed all of the FitLifers in our community for being disconnected & losing our interactive seven year old Facebook page filled with conversations, unique posts & inspiration! There have been a lot of changes becoming a mom and losing close family members even within the last 10 days. Yes, I am going to keep it real with all of you and let you know that I feel a large amount of guilt having fought hard and lost recovering our FitLife Facebook page. It left a bitter feeling never wanting to log on to FB again. Why should we have to start all over again, when I haven’t even accepted the loss in the first place? I went down to the Facebook headquarters numerous times (during my pregnancy) to demand answers from real people to find out what the heck happened, why it happened and how to get our FitLife page back! Have you ever tried to get help or answers from Facebook before? It can be very time consuming and unproductive at best when you get automated responses leading no where. Even building security encouraged me to deal with FB online or over the phone, versus waiting for a representative to greet me with an inquiry form every visit. Neither option truly worked. However, I did learn that the page did not suffer an accidental deletion, nor was it caused by violations in any way. Dealing with loss can be crippling. Dealing with the loss of family members can be heartbreaking! My husband’s dear Auntie Terpie just passed away over a week ago. It has been a tough time. When my aunt passed away over three years ago, my mom said it took ten years from her life and she passed away eight months later. Ultimately my mom never lived to meet her only grandson. I regret asking my mom to keep it a secret until the end of my first trimester, as she never lived to see it, nor share it with her friends. I feel like I robbed her of the one joy she wanted to have as she always asked. (Mind you my eldest sister Simone gave her three granddaughters who always made her smile). Shortly after her passing, my youngest sister Sabrina passed away unexpectedly. This was an impacting blow that I wish I could rewrite. I truly wish that I could have seen things differently and had been there for her when she needed me. No matter where we are in life we all must deal with loss, challenges or failures – one way or the other. Disease, cancer & addictions do not discriminate by age or race. We are seeing more young people dying with unhealthy lifestyles which is preventative and this must be a wake up call for all of us! The small decisions we make in life every day will determine the outcome of our futures. Even if we stray like a lost cat, we always need to get back to the FitLife. Regrets, I do have a few. If I could do things differently, I would. I should have redirected all that pregnant energy elsewhere other than wrestling with FB. But, coulda, woulda, shoulda doesn’t change anything except cause more unneeded stress. Once time is lost you can never get it back again. I am dealing with the physical & emotional loss of my family members and I was still unproductive with the FitLife. I began to focus on living life offline because it was also hard to bare the loss of all my FitLifers who sent many unread messages that were never read or addressed. It is a terrible feeling to know that you have let people down or even worse is knowing that you can never correct the problem. It felt like losing a family member all over again! We can’t change the mistakes that we’ve made and we can’t stop living and producing work due to things we can’t change! Sometimes the things we think are important prove to be unimportant over time. People are always more important & valuable than replaceable things. Taking Action to Create Change! You have the power to be and do whatever you want to do through discipline while effectively using your energy in the direction you choose to focus on. Even if you fall down, it is imperative not to give up… just get up and begin again. Let there be no shame to your game. I have become a mother who stayed active throughout my nine months of pregnancy. Shortly after giving birth my body went through so many changes and I experienced more fatigue! I gave birth to a vibrant baby boy Maxwell who has naturally become a night owl like his father… Mr. Michael “No Sleep” Benjamin. Michael, stays on top of all his social media pages, articles, editorials, columns and lives with his smartphone in hand. Constantly, I have been encouraged by the hubby to get back on track with the FitLife Family to share all of my new experiences & FitLife challenges everyday. It took a long time for me to accept the fact that I cannot change certain outcomes and the losses that I experienced; but, through time I can change my attitude and take control of a situation and choose to move forward. I am starting from the bottom and I am determined to work my way back up the ladder with all of my FitLifers, who I miss so much! Getting Back Up to Start Over Again! FitLifers we must unite, encourage and inspire one another to avoid reacting from a place of fear! Having the willingness to work from the ground up! Repeat after me… “I will take action to do what needs to be done, right now!” Let’s do this while we still have the energy & ability to do it. The FitLifers Challenge will be released in February combining the specific steps on creating “FitLife Long Lasting Changes!” We will produce change without the intimidation; while we build strength & confidence. 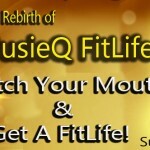 Get ready to Watch Your Mouth & Get a FitLife! PS: Please read this beautiful passage from Author, Larry Benjamin who speaks about the life & loss of Auntie Terpie! He will touch you with his words as we all reflect on the loved ones we have lost.